Below is a brief summary of VMCJ-1’s illustrious history which awaits someone to pull it together with all the details!!! VMCJ-1 was commissioned at MCAS El Toro on 31 July, 1958 with the merger of VMJ-1 and VMC-1. It was the last of the VMCJs to standup and remained at El Toro when VMCJ-3 deployed to Japan in August, 1958. Under the leadership of Lt. Colonel Albert James, who took command on 31 August, the squadron transitioned to the F8U-1P photo reconnaissance aircraft and the F3D-2Q EW aircraft before departing CONUS to relieve VMCJ-3 in November, 1959. The squadron took the new photo aircraft with them to Japan, but took custody of VMCJ-3’s 8 EF-10B aircraft at MCAS Iwakuni. Lt. Colonel James would remain CO until 1 November, 1960, earning the distinction of being the squadron’s longest serving commander. After the initial deployment to Japan, the squadron would be reconstituted on an annual basis until the unit deployments ended in Vietnam in 1966. The squadron colors would remain in WestPac until retired by Lt. Colonel Art Bloomer’s squadron in September, 1975. It would be the last VMCJ squadron. From November, 1959 until April, 1965 the squadron continued to fly the Sharkfin electronic reconnaissance missions with the EF-10Bs under the national Peacetime Aerial Reconnaissance Program that were begun by VMCJ-3 in 1958. These missions not only made vital contributions to the intelligence community on our Pacific adversaries during the Cold War but provided invaluable training for the aircrews in a radar signal environment similar to what the squadron would face in Vietnam. The photo aircraft supported the ground commanders on exercises in Okinawa, Phillipines and Korea. 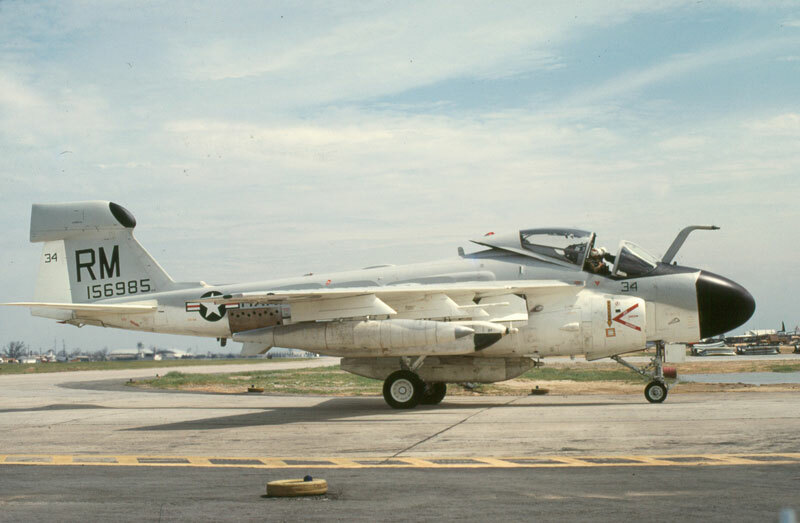 In 1964 the situation in Indochina was heating up and long before the Tonkin Gulf incident, VMCJ-1 began to provide RF-8A dets to TF-77 CVs augmenting the Navy VFP squadrons. They began to fly missions over Laos during that secret war and continued to support TF-77 operations over North Vietnam until December, 1965. The squadron lost is first RF-8A in combat on 13 August 1965 when Major P.A. Mannings’s aircraft from the USS Coral Sea was hit by AAA on a photo run and losing fuel was forced to eject over water where he was recovered. In the Spring of 1965 the JCS authorized the Rolling Thunder bombing campaign against selected targets in North Vietnam. Faced with the rapid buildup of radar controlled AAA and newly identified SA-2 Surface-to-Air missile sites, an urgent order came to deploy VMCJ-1’s EF-10Bs to Danang, RVN. Lt Colonel Wes Corman led a detachment of 6 EF-10Bs to Danang on 17 April, 1965 , where they were quickly assimilated into the TF-77 and USAF 2nd Air Division’s daily frag order providing threat warning and ECM support for their strike and reconnaissance aircraft against the NVN air defense radar nets. 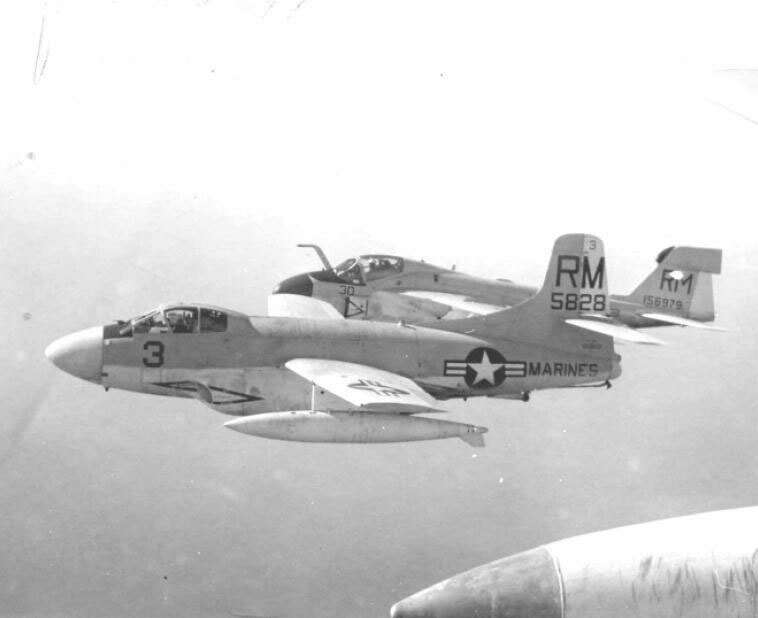 The historic first USMC combat mission employing active ECM or jamming against enemy radars was conducted by EF-10Bs on 29 April, 1965 in support of a USAF strike mission. Another first occurred on 27 July, 1965 when 4 of VMCJ-1’s EF-10Bs supported a massive USAF strike against one of the newly identified SAM sites near Hanoi. From that point on until the end of the war the focus of the squadron’s ECM support was against the SA-2 and its associated radars. On 18 March, 1966 the squadron lost its first EF-10B and crew to known enemy action, when 1/Lts. McPherson and Davis aircraft was shot down by a SA-2 missile Northwest of Vinh. Before departing Vietnam the squadron would lose 4 other EF-10Bs and crews to accidents or unknown causes. The RF-8As were replaced by the new RF-4Bs in October 1966 and the EA-6As arrived at same time to take over ECM missions in the highest threat areas but the EF-10Bs remained in Vietnam service until October, 1969. The squadron was withdrawn to Iwakuni, Japan in July, 1970 with the drawdown of U.S. Forces in Vietnam. It quickly picked back up with the peace time missions of the past but was on a standing alert to return to Vietnam to support Navy contingency operations. A detachment of EA-6As flew back to Danang to support the ill-fated Son Tay prison raid in November, 1970. In February , the squadron sent an EA-6A det to Sydney Australia to support a Fleet Anti-Air-Warfare exercise on the eve of its return to Iwakuni was ordered back to Danang to support TF-77 protective reaction strikes against NVN. Another, more extended deployment was made in April. In April of 1972 the squadron was deployed to NAS Cubi Point to support the Linebacker I and II operations. They were later augmented by a VMCJ-2 det and together provided sustained ECM support of TF-77 and B-52 strikes against the heavily defended targets around Hanoi and Haiphong, cycling through Danang from Cubi Point. The EA-6As remained at Cubi after the end of the U.S. operations in January, 1973 until the June. The RF-4Bs meanwhile continued their peacetime photo operations at MCAS Iwakuni. In October, 1973 the EA-6As began to support deployed periods of the USS Midway which was home ported at Yokuska. The 4 plane dets would cycle back and forth to the beach to cover 1st MAW requirements. They were joined later by the RF-4Bs and the squadron continued to support the Midway until its decommissioning in September 1975. While on the Midway, the squadron’s EA-6As flew cover for the evacuation of Saigon in the Spring of 1975. For its service during the Vietnam War the squadron was awarded 4 Navy Unit Commendations or Meritorious Unit Commendations for specific periods and the shared in the Presidential Unit Commendation award the First Marine Aircraft Wing.